October 31 means different things to different people—Protestant Christians celebrate Reformation and prepare for All Saints’ Day, while secular society celebrates Halloween. But Christians also get caught up in the secular celebrations of Halloween, usually “all in good fun,” yet sometimes that “fun” can be to our detriment. We must remember that “Satan disguises himself as an angel of light” (2 Corinthians 11:14 ESV) and is “the father of lies” (John 8:44 ESV). Therefore, we are called to look to Christ to resist the schemes of the devil, which often manifest themselves on days like today. 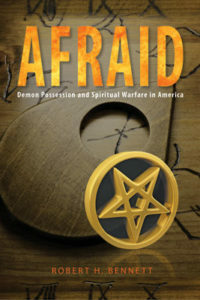 In his fascinating and insightful book Afraid: Demon Possession and Spiritual Warfare in America, Rev. Dr. Robert Bennett equips Christians not only to recognize the devil’s influence in our society but also to respond boldly in faith. The following excerpt is a good reminder for us that even when we feel weak and afraid; when we are bombarded by images of ghosts, devils, and witches; and when we are tempted to fall prey to pagan Halloween traditions, Jesus is there and will never leave our side. The world in which we live is not spiritually neutral. There is evil in this world, and behind that evil is the devil and all his demons. It is true that humanity is included in this evil, but Satan and his demons stand behind that evil. St. Paul makes this clear in Ephesians 6:12 when he speaks of the central problem of this world; namely, the cosmic powers over this present darkness, and the spiritual forces of evil in the heavenly places. If Christians do not recognize the fallen nature of the world, they will not only fall into its traps but will also seek answers in the wrong places. Any spiritual answer that does not have at its center the work of Jesus upon the cross and the empty tomb of the resurrection is a lie—and behind that lie is the devil.
. . . When someone ascribes power to words or items that God has not commanded, he or she falls for the lie of Satan, who seeks to nullify the Sacraments that Christ Jesus has instituted and raise in their place false sacraments of his devising. One of the most common and dangerous forms of Christian animism is prayer. Prayer becomes a problem when we begin to ascribe power to the words prayed rather than to the One who promises to hear the prayers. The only power prayer has for the Christian is the power of the promise that God has made to hear the prayers of His saints and answer them as a dear Father. Such a promise is a great blessing and brings comfort to every Christian. When prayer is elevated to a Means of Grace, the place of the preached Word and Sacraments, it has transitioned into something for which it was not intended. The point here is that God has promised to act on our behalf through His Word and Sacraments and not through prayer, words spoken by the Christian. The difference between prayer and the Word and Sacraments—the Means of Grace—is that the Means of Grace have real power to deliver life and forgiveness. Through these gifts, faith is created and the devil is cast away.
. . . God has declared the Christian righteous because of the work of Jesus. As a result of this righteousness, Christians have a new standing before God. Rather than standing in the sin that continues to cling to them, they stand in the holiness of Jesus, who has covered them with His righteousness. This is the doctrine of justification. For Christians who recognize this truth, the gates of hell have been driven away, and life carries a new meaning. Without the fear that death brings only annihilation or eternal punishment, Christians begin to recognize that while they will still find themselves in times of weakness and fear, Jesus is there by their side and will not leave them alone. Even as sin, death, and the devil appear to be winning the battle, the cross of Jesus and the empty tomb declare their victory. We have nothing to fear from this world or the devil. Such is Jesus’ promise on Easter morning. Fear has no place when sins are forgiven and death is destroyed. The greatest weapon the Christian has against the fears of this world and the spiritual attacks of the devil is his Baptism. In the waters of Baptism, the Christian dies with Jesus, is raised to new life, and is promised that he will rise to be with Jesus in eternity. Therefore, “Do not be afraid” (Matthew 28:10), and “Peace be with you” (John 20:19; cf. Luke 24:36–39). These are the first words that Jesus spoke at His resurrection, and they continue to resound in the ears of the baptized, calming our fear and giving us hope today. Selected paragraphs from Afraid: Demon Possession and Spiritual Warfare in America, pages 174–75 © 2016 by Robert H. Bennett. Published by Concordia Publishing House. All rights reserved. To order Afraid, visit www.cph.org or contact CPH at 800-325-3040.